In a room with nothing more than a table and chair, not a single distraction existed for the 4 to 6-year-old child. Nothing, except the marshmallow. The fluffy treat sat alone on the table, placed there minutes before with the promise of a second marshmallow to come if she didn’t eat the first. Delayed gratification. Self control. Strategic reasoning. These qualities, according to psychologists Walter Mischel and Ebbe B. Ebbesen who first conducted this experiment at Stanford University in 1970, would result in life success. Yet, just one third of the original 600 children to take part in the experiment resisted long enough to receive the second marshmallow. So what is it that makes some children succeed while others do not? And what can we do to guide kids toward success? New research from economists, neuroscientists, psychologists and medical doctors, presented by Paul Tough in How Children Succeed, argues that character is more crucial than the IQ measured on standard tests in achieving success. This goes against the popular thought that to be successful children need as much cognitive stimulation as possible in the first three years of life in order to arrive in kindergarten ready to learn, the result of the 1994 Carnegie Corporation report Starting Points: Meeting the Needs of Our Youngest Children. Just think “Baby Einstein” sales ($20 million before it was acquired by the Walt Disney Company in 2001). One such economist, James Heckman from the University of Chicago, wondered if a GED recipient (roughly 1 in 7 of those with a high school credential) has the same success in future outcomes as a student who completed four years of high school. As Tough details, Heckman analyzed large national databases and found that at age 22 just 3 percent of GED recipients were enrolled in a four-year university, compared to 46 percent of high-school graduates. Further, GED recipients didn’t fare any better than high school dropouts in important future outcomes like annual income, unemployment rate, divorce rate, or use of illegal drugs. He concluded that the psychological traits that had allowed the high-school graduates to make it through school—such as an inclination to persist at a boring and often unrewarding task, the ability to delay gratification, the tendency to follow through on a plan—were all valuable in college, the workplace, and life in general. So where do nonprofit organizations, specifically The Salvation Army, fit in? Anderson specifically pointed to 2 Peter 1, which lists the following qualities: goodness, knowledge, self control, perseverance, kindness, and love—the elements of good character. If you look at recent violence in our society, Anderson said, as well as many other social ills, it is not due to lack of cognitive ability, but poor character development—for example, an intelligent bank robber who lacks the character trait of goodness. “Having an average level of intelligence gets you on the playing field of life, but character traits will determine whether you do something worthwhile with your life,” Anderson said. Understanding that character building begins with one’s parents, the Caldwell, Idaho, corps began Baby Haven in 2006, an educational incentive-based 2-year program focusing on healthy families, starting at pregnancy. It offers classes from communicating with your child, to family finances to breastfeeding in both English and Spanish. A nutritionist visits family homes for a five-class series on healthy eating, and the couponing class teaches how to create a calendar of meals for the month, stock a pantry, and budget. Parents receive credit for attending class, during which childcare is provided, and can use that credit to buy items like diapers or shampoo—things that are not covered by food stamps. With 220 registered clients, Program Director Rebeca Johnson said she hopes to begin literacy classes for parents so they can help their children when they start school. Anderson said it’s these values, more than anything else, that impact individual character building. While other adults can have a positive effect on the child, Anderson said, it’s the people he or she is around most that have the most influence. Ed Covert, camp director at The Salvation Army Redwood Glen Camp in Central California, uses empirical data to explain the effect of camp on a kid’s life. Covert began collecting data, modified from the American Camp Association (ACA) youth development outcome measurements, on campers relating to spiritual well-being, affinity for nature, responsibility, interest and exploration, and teamwork in 2012. His staff collected 800 surveys last summer, and used the data to continually tweak programming. “Grit is the key to success; the old school description of that stuff was risk and resiliency, but now we call it grit,” Covert said. “What are those non-cognitive things that allow a kid to rise above their circumstances? What is it about a kid that comes from the same environment as siblings but one rises above the path of dysfunction? It may just be the perfect setting to develop grit. Take swimming, for example. To cannonball into the deep end during free time, you have to have a bracelet that indicates you passed the swim test. 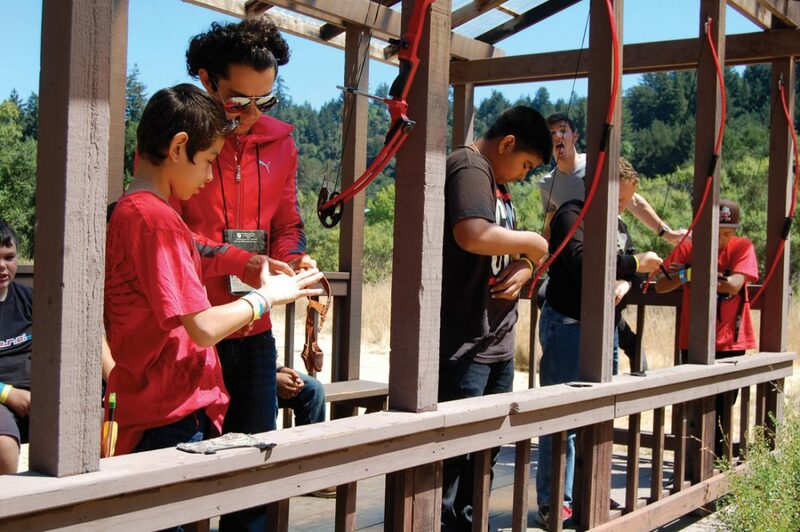 It’s also a place for kids to develop new skills—say, archery. Anderson said programs like camping can have a really significant impact on a child. “In the richness of the camp experience, for kids who don’t have good homes, this is their first exposure to what healthy relationships, structure and rules, look like,” he said. At 13, after spending each summer attending a day camp for kids ages 5 to 12 at The Salvation Army Oakland Chinatown Corps, Julia Yu started something new—a three-year leadership program focusing on youth development. Yu was later hired as a teaching assistant, then a teacher and finally as director of the summer day camp for 250 kids in 2012 at age 18. From infant to adult, our impact and influence on an individual’s future success must include fundamental questions about how parents affect their children, how human skills develop, how character is formed, and how The Salvation Army fits into each one. We need character. We need grit.